Heirs and beneficiaries may disclaim all or part of an inheritance should they decide that the inheritance is more trouble than it's worth. It is possible, for example, to inherit real property that is located too far away to be of benefit, or personal property that simply isn't wanted. Additionally, tax consequences may render an inheritance a liability. When property is inherited jointly -- by two heirs or benefices together -- if the heirs can't decide how to share the property, or if refinancing is required and one heir can't qualify, it may be easier for one party to bow out by disclaiming the inheritance. Draft a renunciation or disclaimer form. Such preprinted forms can be acquired from a local probate court or an online legal document provider. You also may draft your own. Check your state's probate statutes to ensure that all the information required by your jurisdiction is included in the document. Generally, an inheritance renunciation or disclaimer form must be in writing and must contain the name of the decedent, a description of the inheritance to be disclaimed, a statement of intent to disclaim the inheritance and a description of what portion of the inheritance is disclaimed. Sign the form in the presence of a notary public and have it notarized. Check your state's probate statutes to confirm any time deadline required by your state for disclaiming an inheritance. California, for example, requires that the renunciation or disclaimer form be filed within nine months of the decedent's death, or within nine months the inheritance becomes "indefeasibly vested," whichever is later. File the form within your state's required time frame. Check your state probate code to find out where to file the form. Some states require that the form be filed by delivering it to the estate's personal representative, commonly known as the executor. Confirm that your jurisdiction also does not require you to file a copy directly with the court. You may renounce an estate by completing and filling a renunciation form in the probate court handling the estate proceedings. Once you renounce your interest in the estate, you don't have any legal right to, or responsibility for, the inheritance you were left. 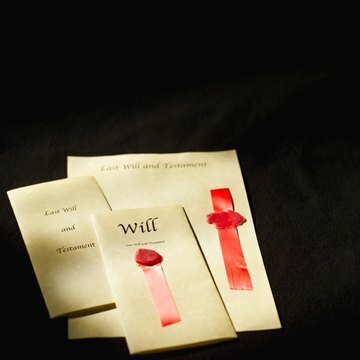 An heir may renounce an estate for various reasons, including to avoid inheritance tax consequences or to decline ownership of property that is carrying debt. You must renounce the estate before you take legal possession of your inherited property.